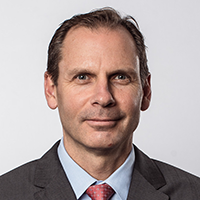 Martin Schroeter is Senior Vice President, IBM Global Markets, responsible for IBM’s revenue, profit and client satisfaction worldwide as well as IBM’s Global Financing business, the world’s largest captive IT financier. He was previously Senior Vice President and Chief Financial Officer, a position he held from January 2014 through December 2017. Prior to that, he served as General Manager of IBM Global Financing, where he managed a total asset base in excess of $37 billion. Mr. Schroeter also served as IBM Treasurer, responsible for the company’s balance sheet, cash flow, capital structure, interest rate and currency risk management and treasury operations. He has also served in a variety of business line and finance executive positions, including Vice President of Global Technology Services, Asia Pacific; General Manager of IBM Global Financing, Asia Pacific; and CFO and Finance Director, IBM Australia and New Zealand. Mr. Schroeter received his MBA from Carnegie Mellon University and his undergraduate degree from Temple University.